I realized after I published the previous post that I forgot to talk about bing su! 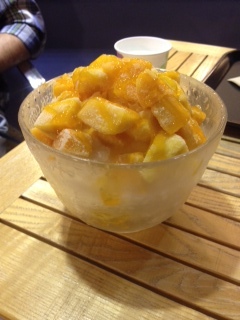 We tried bing su (pronounced bingsoo) for the first time at our favorite neighborhood coffee shop, ToPresso. 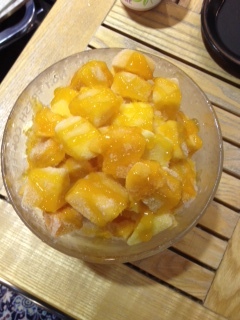 Bing su is a Korean summer treat made with shaved ice, condensed milk, and usually fruit syrup and chopped fruit. There are several variations. The most popular is red bean, but we’ve seen all sorts of bing su – green tea, chocolate brownie, and coffee. All the bing su we’ve seen has been in gigantic portion sizes. 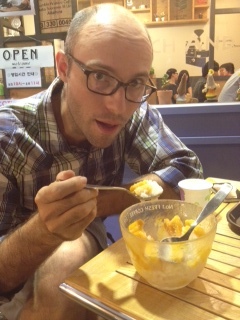 We opted for the mango and we split it between the two of us. 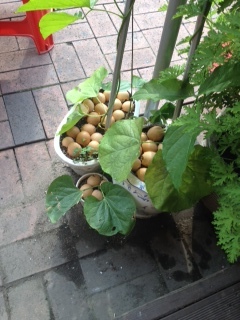 It was really delicious! Next time I definitely want to try the chocolate brownie one. Okay, on to this past weekend. This past weekend was our last as poor people! We realized that we have been here for 7 weeks without pay – that’s a long time!! So we did a little bit but it was a pretty relaxed weekend (read: boring). On Saturday Zach wanted to find a place where he could practice his trumpet. He had discovered a website where he could look up practice rooms in our area and had a teacher from school help him translate it. So we set off on Saturday afternoon – full of coffee and pastries – to find A Pro Practice Rooms. As we have come to learn in Korea, things close and disappear all the time and A Pro Practice Rooms was another casualty. A lot of times we have trouble even finding the correct location because street addresses are a relatively new phenomenon here in Korea. 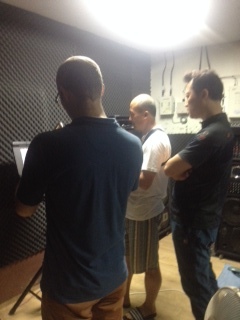 This time though, we actually found the right building and A Pro Practice Rooms was no where to be found. Luckily, the pastor from the church across the street noticed us (a couple of white people wandering around looking confused and lost) and took pity on us. He came over to help us and we communicated in single words and hand gestures for the most part. We figured out that we were in the right place but that A Pro had moved out. Then he asked a couple of people to make sure. Verdict: A Pro was gone. As we were about to wander off and figure out our Plan B, he asked Zach (again, in mostly gestures) what type of instrument he played. When he saw the trumpet he went across the street and poked his head in a shop. When he emerged he motioned for us to follow him. So we followed him down the street and ta da! 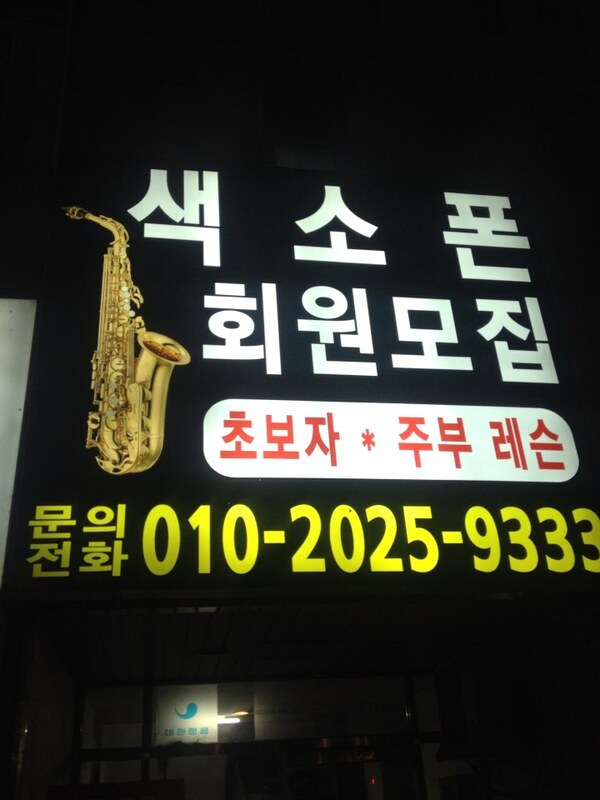 We were standing in front of a building with a saxophone on the sign! It turned out that in the basement of a nearby building there was a practice area specifically for saxophones, we think. The pastor led us downstairs and introduced us and I suppose told them that Zach had a brass instrument that was like a saxophone. Then we bowed and he left. It was a fairly awkward situation. There were 3 Korean men standing around wondering how they could talk to us and then there was us, a white couple very out of their element wondering what we were able to say in Korean that would make sense. It was pretty hilarious. 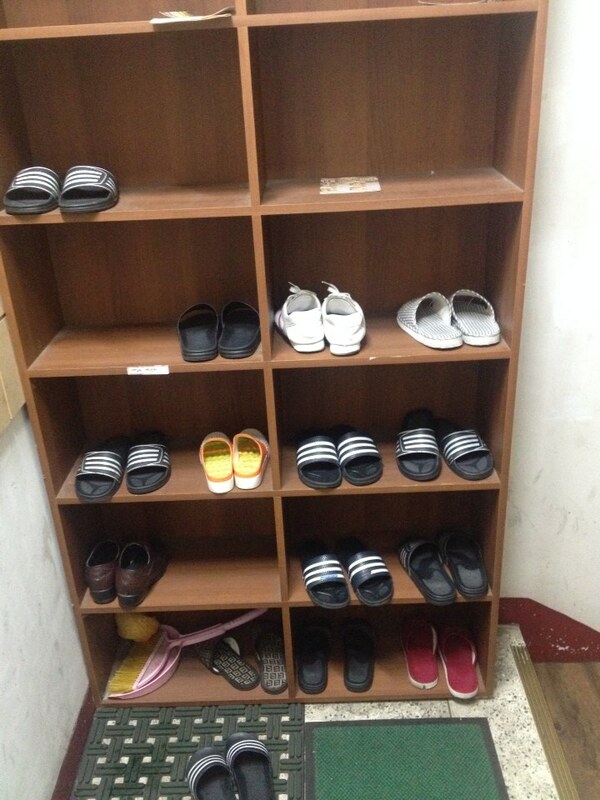 We had to take off our shoes and exchange them for indoor footwear. 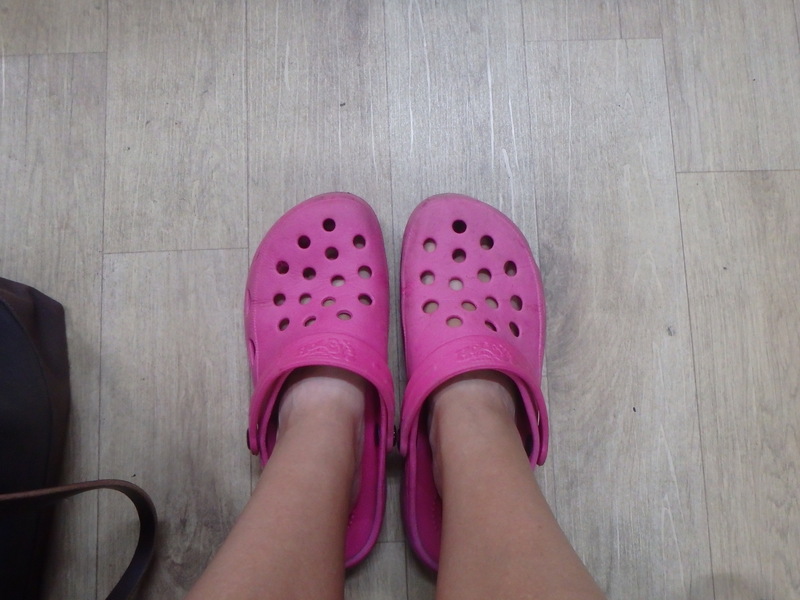 I guess it wasn’t weird for Zach because he had socks on, but I was wearing sandals so I had to put my bare feet in some potentially icky Crocs knock-offs! Eventually Zach went back to a practice room with another Korean man and they played along to a strange soundtrack with songs from Tom Jones and Andrea Bocelli. It was very amusing for me and I did sneak a couple photos with my phone. Sorry for the poor quality but I thought it would be strange for me to whip out my camera. The whole thing was really funny and very awkward. At the end, they offered us some Korean blueberry juice in a pouch (the picture on the front looked like blackberry?) 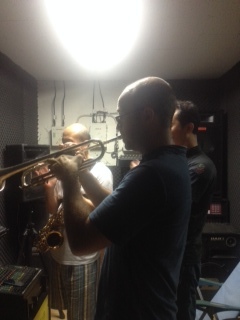 and had Zach sign up to use the practice rooms. I have a feeling Zach and those Korean men will end up becoming best buds in the future. 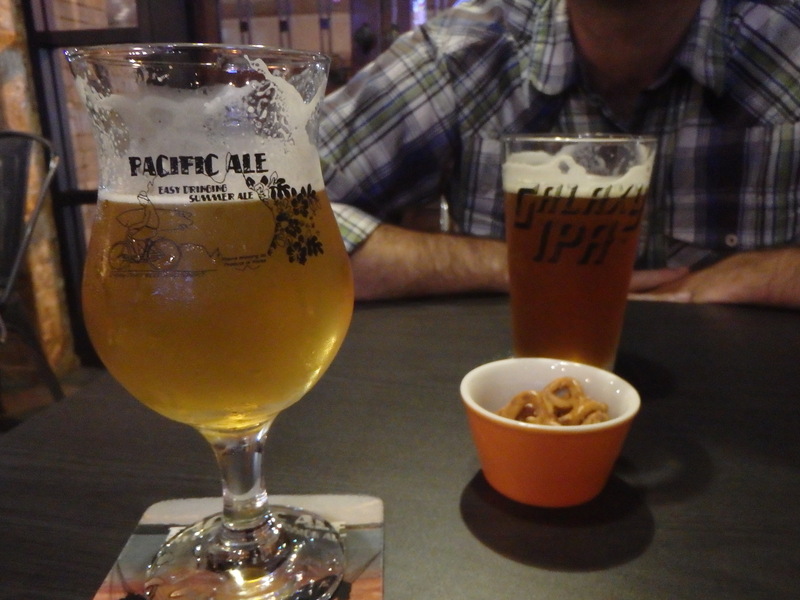 On Saturday evening we went to try out another craft beer tap house, Craft Brothers. 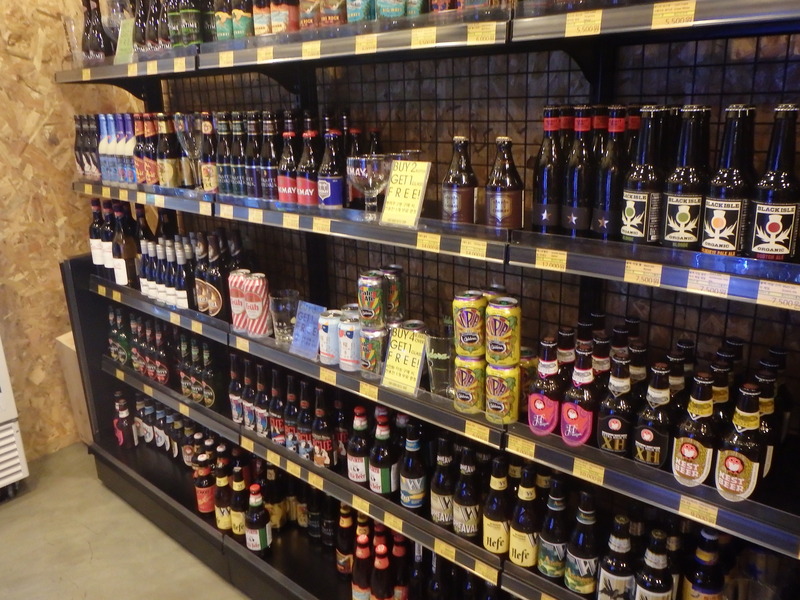 Craft Brothers is a tap house and bottle shop! 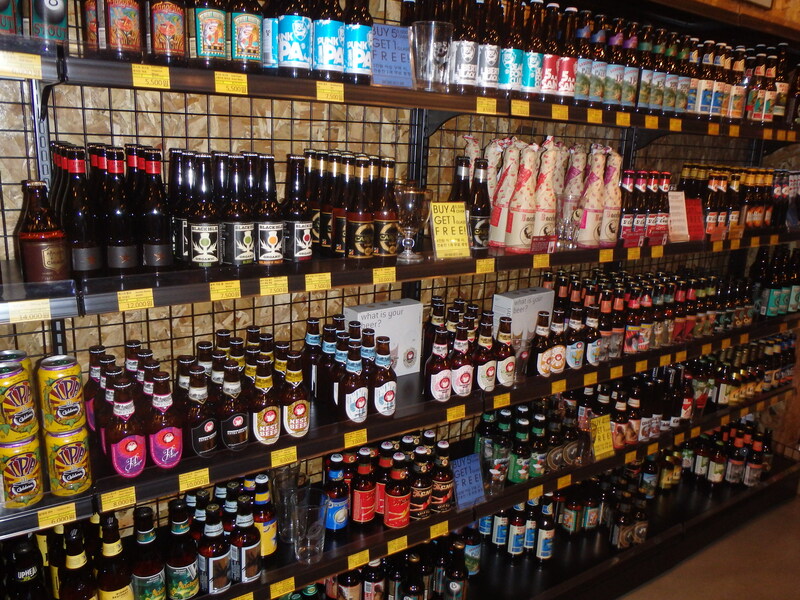 Although we didn’t buy any bottles we will definitely pick up some beer the next time. 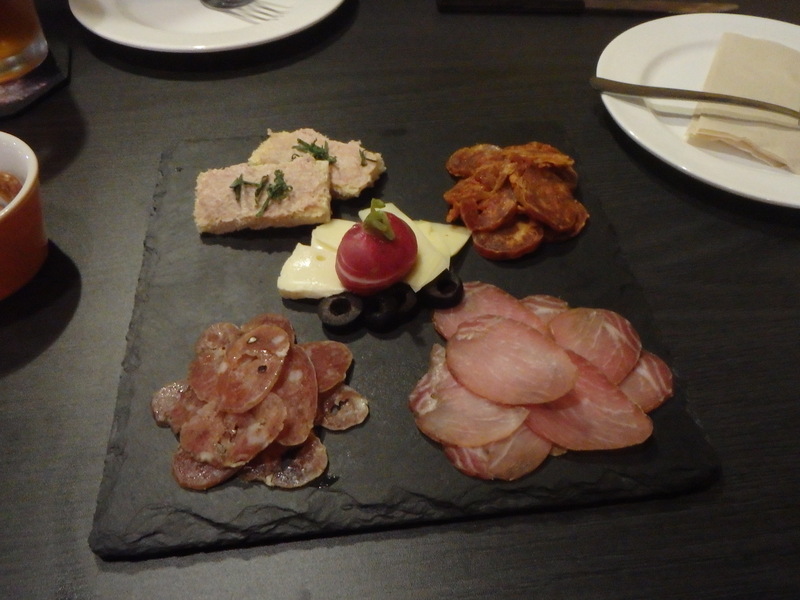 We each ordered a beer and had a little meat and cheese plate. It was a very refreshing change from the plain meals we’ve been making for ourselves lately. 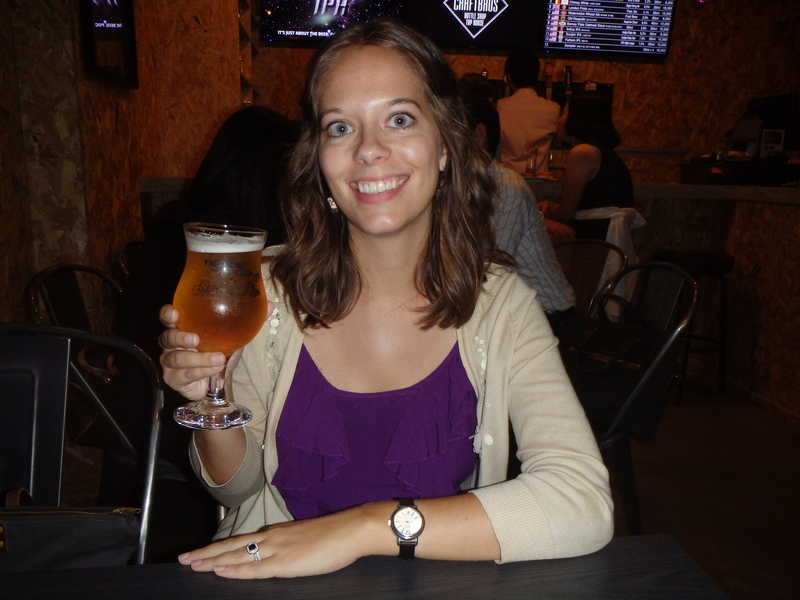 We both tried Korean craft beers – not bad! On Sunday we were very boring. We tried watching the Texas game in the morning but nothing worked so we just followed the score online. Then we did chores and hung out in our apartment. 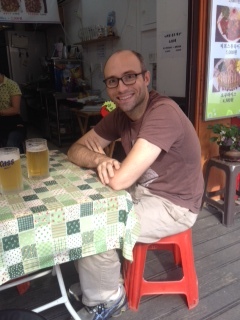 However, our apartment is small and I can’t stay inside all day, so we eventually left and went a couple stops up the subway to another part of Goyang – Ilsan. We found a really wonderful place with Indian curry one of the first weekends we were here so we decided to go there for lunch. It’s a very basic outdoor stall but the woman who runs it has a husband who is a chef at an Indian restaurant nearby, so we can order the curry from her and get it cheaper than eating at his restaurant. 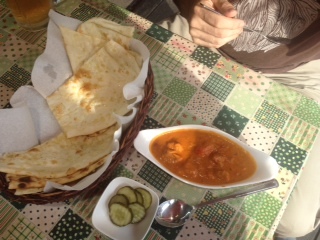 The curry is excellent and the garlic naan is fabulous. Ugh. I want some just thinking about it. I really enjoy going there because her stall is in a huge shopping area in Ilsan that we wrote about previously – La Festa. Sitting at her stall drinking crappy draft beer, waiting for our curry, and people watching is a great way to pass the time. I think we’ll become regulars. After our delicious curry we got a little dessert from another street vendor in La Festa. So far I haven’t noticed these anywhere else. 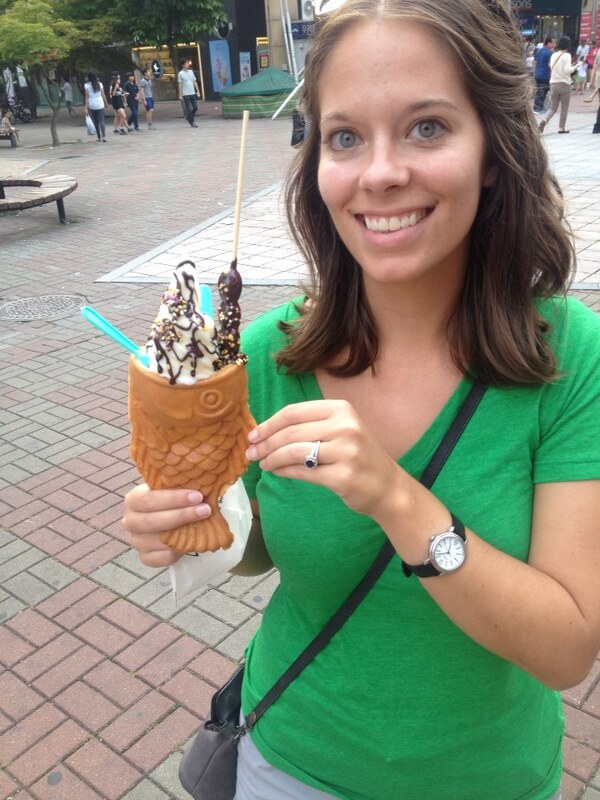 I couldn’t resist eating ice cream out of a fish cone. After our dessert (Zach spilled ice cream all over his pants which was pretty hilarious!) we went and wandered around Lotte Department Store. It is really unlike any department store I have been in except maybe the Macy’s in Harold Square. Lotte is several levels (I think 10?) and is definitely geared toward a shopper with more money to blow than us! It was fun looking around though and we did enjoy their book section. Maybe sometime we’ll eat at their TGI Friday’s. Yeah, they have one of those. Anyway, this weekend we have a four day weekend because it is Chuseok in Korea. (I’ll go into more about Chuseok on the next post.) We are getting out of town and going to Kyoto! Hooray!